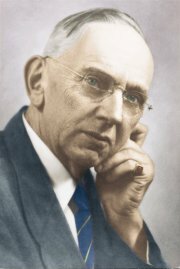 Edgar Cayce recommended many procedures for the health of the eyes that would help prevent or clear up cataracts. Cataracts occur when the clear lens of the eye becomes clouded. The progression is painless and often not noticed until it has progressed quite a bit. The process is begun by poor circulation that prevents the eye from ridding itself of “debris.” Cayce also considered spinal lesions that block nerve impulses as contributing to the condition. The following procedures were recommended for maintaining eye health and reversing many conditions: spinal adjustments in the upper cervical and dorsal areas to aid circulation; include in the diet plenty of seafood, carrots and carrot juices, and B-vitamins; use the Violet Ray Device directly on the eyes while closed and on the back of the neck to “enliven the nerves”; use Glyco-Thymoline either as a poultice over the eyes or as eye drops (1 part Glyco to 2 parts distilled water); potato poultice (scrape the white part of the old Irish potato with the flat edge of a knife and collect onto a cloth) over the eyes to draw out accumulated toxins, and a general massage with peanut oil to aid elimination. When Edgar Cayce was asked about illness, he would almost always approach the condition from the perspective of changing the underlying conditions. Usually with any illness there are conditions of constriction causing poor circulation of blood and nerve energy resulting in an accumulation of toxic substances and inadequate nourishment of the affected areas. In general we should pay closer attention to Circulation, Assimilation, Relaxation, and Elimination (C.A.R.E.). The major cause of cataracts, as seen in the Cayce readings, is impaired circulation and eliminations leading to accumulations in the sensory system. Other causes less frequently cited include: spinal lesions and sub-luxations, digestive disturbances, dietary insufficiency, mental attitudes, mechanical injury, and constitutional condition. In one or two instances, no specific cause was given. Even in most of these instances poor circulation and elimination were the final mechanisms that allowed cataracts to form. For instance, in reading 2193-1, elemental dietary deficiency resulted in anemia, which in turn led to altered circulation and impaired elimination resulting in the formation of cataract deposits in the eyes. The mental strain produced by associated symptoms further led to depletion of the nervous system. Another variation is seen in reading 3598-1. In this case the cause was digestive disturbance as a result of over-activity of the glandular forces (system) affecting the duodenum. This in turn was caused by pressure on the spine at the level of the fifth, sixth thoracic (dorsal) spinal segment, which affected the hypogastric and pneumogastric centers. The finding results were poor assimilations and eliminations. Improper attitudes can work to bring about physical problems, including cataracts. In reading 3335-1, this was associated with disturbances in assimilation and elimination, resulting in other problems including cataracts. In reading 5451-2 the patient’s poor attitude included improper care for his body as reflected in poor dietary habits, which contributed to developing this illness. In summary, it can be stated that in the great majority of people for whom Cayce gave readings on cataracts, disturbances in circulation and elimination were the final mechanisms through which the disease came about. In a few instances the basis of the problem was of a nonphysical nature which set into motion forces that brought about a physical condition. the most common underlying problem being circulation/elimination disturbances; others include spinal lesions, digestive disturbances, etc. Appropriate therapy is selected on the basis of what is seen as the major underlying problem. such as attitudes and emotions. Physical problems nearly always overshadow the non-physical and thus the latter may be easily overlooked. In such instances only partial results are obtained when therapy is directed solely to physical causes. ‘Mr. Cayce: So to relieve this condition we would, with the action of mental force, or expression, over the sensory system so control the circulation as to cause the proper elimination, or eliminating channels to be directed to the specific cause. See? What this passage is pointing out is that we must work on all levels – spiritual, mental and physical – for one is just as important as the others. If the physical body is unable to make use of the channeled spiritual and mental forces, little good is done by using physical applications exclusively. This passage also indicates that the higher forces are channeled through the nervous system. Another example is to be found in reading 5451-2. This patient was already receiving treatments from other sources and was satisfied with what was being done. Cayce indicated in this instance that as long as he (the patient) felt this way, other treatments would not be advised, for they would be ineffective. 1. Osteopathy. Adjustments in the upper cervical and dorsal segments (C1, 2, 3; DI, 2, 3); sometimes in the lower dorsal coordinating with the upper lumbar. Frequency: about twice weekly for five to six weeks with rest periods of two to three weeks. This was by far the most commonly prescribed treatment. 2. Massage. With peanut oil (sometimes a combination of oils). Frequency is variable. Again twice weekly would be reasonable, though in one instance it was recommended on a daily basis before retiring. Emphasis to spine, mastoid, temple and chin areas. 3. Violet ray treatment. Sometimes recommended only after the first osteopathic series. Would be applied along the spine, head and neck areas for three minutes, then with the double-eye applicator over closed eyes for another one-and-a-half minutes about three times per week. A Glyco-Thymoline or Epsom salt pack may be used over same areas for 20-30 minutes prior to the violet ray treatments. Discharge from the eyes may occur with these treatments. This should be wiped off with a non-irritating, antiseptic solution. Potato poultice may also be used after the violet ray treatment. Wash off with weak eye solution that will remove inflammation drawn by the poultice. 4. Eliminations. At least once or twice daily using natural laxatives, e.g., Eno salts, Fletcher’s Castoria, bicarbonate of soda with cracker crumbs, etc. ; colonics, if necessary. 5. Diet. A wholesome diet rich in fruits and vegetables. Seafoods are allowed but no meats (except chicken) or sweets. Raw carrots, lettuce, celery, watercress and the like are beneficial. 6. Vibratory treatment. Another way of stimulating blood flow is, first, rub the body with cold water to produce shock, followed by fast vibratory treatment (reading 3943-1). Frequency and duration not specified. Twice weekly treatment is suggested lasting 20-30 minutes. 7. Spiritual counseling, prayer, and meditation. These are other modalities available to ensure integration of the triune body, mind and spirit. Still, what has been the most useful to me personally is what I found on the topic in the same dear old book of mine already quoted in a previous post I wrote here about Edgar Cayce. 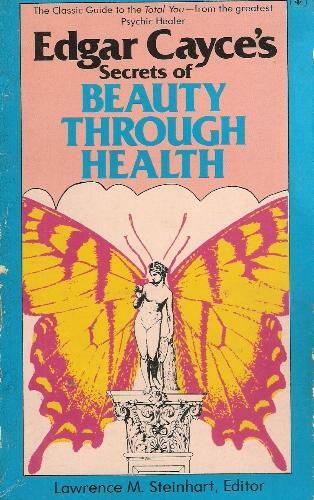 The title of that book by Lawrence M. Steinhart is ‘Edgar Cayce’s Secrets of Beauty through Health’, first published in 1971, in its fifth printing in 1976, and I hope still being re-printed, for it is such an excellent book – well, I just googled it too, and I am very happy to announce it seems to be all over the place, including on Amazon!… Even the old cover I still have on my own ancient and battered copy is still there too , just as I had tried to describe it in that previous post of mine: allelujah! It is much better to actually see that cover! Other covers in a different style are also available, but I always liked that one very much, and I guess the author (now deceased) may have cherished it as well while he was here physically to witness the totally deserved success of his work. Remember that all those ‘readings’ were given before 1945, when visualization and such were not yet part of what is now advised and practiced by many in our more recent, ‘New Age’ times… Edgar Cayce has been a precursor in truly innumerable ways, also indicating often the important underlying connections between functions in our body which are not generally known to be connected. Regarding the eyes – our primary topic in this post – I have found in the cases quoted in this book several mentions particularly of a link between them and the kidneys, the proper functioning of which depended in turn upon the individual drinking enough water everyday, starting with a full glass first thing upon arising in the morning, and some also before and after meals. From my own experience of the past six months, I can vouch for the ‘head and neck exercise’ and certify that, together with plenty of water taken internally as well, there is an instantaneous improvement of the vision every time during the day that I am doing that exercise while I am sitting at my desk and writing this blog! Thank you for sharing this! I recently found out upon checking with my Arizona eye doctor, that my eye’s grade has increased by 75. I don’t have cataract, but I do try the head and neck exercise, also assisted with plenty of water, shows improvement in my vision. I’m yet to check on my next visit if my eye’s grade have indeed got lower. My comment down below was actually directed to you… Sorry for the technical mistake!